Eerdmans Books for Young Readers, 9780802853073, 36pp. Sangoel is a refugee. Leaving behind his homeland of Sudan, where his father died in the war, he has little to call his own other than his name, a Dinka name handed down proudly from his father and grandfather before him. When Sangoel and his mother and sister arrive in the United States, everything seems very strange and unlike home. In this busy, noisy place, with its escalators and television sets and traffic and snow, Sangoel quietly endures the fact that no one is able to pronounce his name. Lonely and homesick, he finally comes up with an ingenious solution to this problem, and in the process he at last begins to feel at home. Written by the authors of the acclaimed Four Feet, Two Sandals, this poignant story of identity and belonging will help young readers understand the plight of the millions of children in the world who are refugees. Karen Lynn Williams has written several books about the difficult lives of children around the world, including Galimoto (Lothrop, Lee & Shepard), Tap-Tap (Clarion), and Circles of Hope (Eerdmans). Karen has lived in Haiti and Malawi, but now lives in Pittsburgh, Pennsylvania. Visit Karen Lynn Williams's personal website: www.karenlynnwilliams.comKhadra Mohammed is the executive director of the Pittsburgh Refugee Center and has worked with refugees in the United States and abroad for more than twenty years. 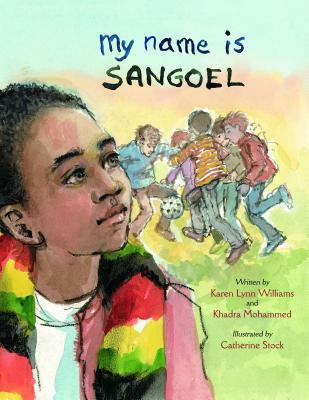 Khadra lives in Pittsburgh, Pennsylvania.Catherine Stock is the author and illustrator of Where Are You Going, Manyoni? (Morrow) and Gugu's House (Clarion). She has illustrated numerous other books, including Karen Lynn Williams's Galimotoand the Gus and Grandpa series of books by Claudia Mills. She lives in New York and France. "